When most people think of diamonds, they imagine clear, sparkling stones, but not all diamonds are clear. Blue diamonds are actually among the most rare and valuable of all diamond colors. With a rich, distinctive hue, these luxurious gems make superb engagement rings for discriminating women. Natural blue diamonds are formed from minute traces of boron in the stone's chemical composition, an inclusion that occurs in less than 0.1 percent of natural diamonds. A large amount of hydrogen in the stone can also create a blue hue. The blue shade can range from a pale hint of color to a rich, steely shade similar to the Hope Diamond, one of the most famous blue gems in the world. Stones with a rich solid color are the most expensive -- a blue-green or blue-purple shade will be less expensive, since their coloring indicates the presence of more than one mineral impurity in the gem. The deeper the color, the more desirable the stone. While colored diamonds are fairly common, those with the deepest colors are termed "fancy" and are suitably more expensive. The Cullinan Diamond Mine in South Africa the world's leading producer of blue diamonds. One huge blue diamond from the Cullinan mine broke the world record for the highest price per carat. In 2009, the 7.03 carat, cushion-shaped diamond in a vivid shade of blue was sold at auction for $9,488,754. 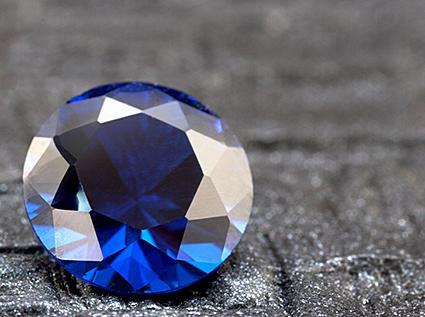 Other bright blue African diamonds have sold for almost as much per carat. According to a UPI report, a 25.5 carat stone was unearthed at the mine in 2013. There are expert diamond sales executives at the Cullinan showroom who can help you choose and purchase a diamond. You will also be able to watch diamond cutters and polishers take a rough diamond and turn it into a beautiful stone. You can also experience Cullinan firsthand with a guided tour offered at the mine. These tours range from surface tours, diamond safaris, tours of the village and even underground tours of the mine. Leibish & Co.: Buy Gemological Institute Of America (GIA) graded loose blue diamonds in a wide variety of carat weights and shapes and have them crafted into a unique engagement ring. Blue Diamonds: Browse through their wide selection of cuts and settings available from this UK retailer to find the perfect piece of jewelry to suit your individual style. My Solitaire: My Solitaire has an extensive selection of blue diamond solitaires designed especially with the need of brides-to-be in mind. Front Jewelers: Sweep her off her feet with a romantic blue diamond engagement ring from Front Jewelers. To prevent a poor color comparison, blue stones are best set in white gold, platinum, or titanium. The setting should be suitably secure to prevent loss or damage to the valuable stone, particularly because its rarity will make it difficult to replace. It's important to be aware that some blue stones are genuine diamonds, but they are not natural blue diamonds - instead, they are clear stones that have been treated for color. 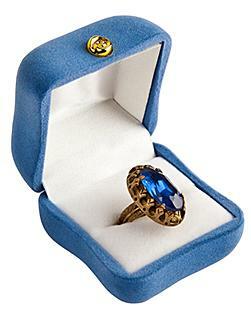 Irradiation can alter the stone's crystal structure to reflect blue light, resulting in a blue stone. High temperature (HPHT) treatments can "repair" flawed stones and in the process, create different, more desirable hues. Coating involves applying a thin layer of color to the stone in order to change its color. All treatments are delicate and unpredictable and treated diamonds can change their color over time. Patrons who consider a treated stone should always examine the jewelry lab certificate to ascertain the extent of the treatment as well as any available warranties to cover potential changes in the future. Blue diamonds are rare and unusual stones with rich, distinctive hues that every jewelry connoisseur can appreciate. Customers should always take appropriate precautions when purchasing rare gems, however, to ensure they are not inadvertently buying a synthetic stone rather than a genuine precious gem. While more affordable options are available, few gems approach the exquisite beauty of a true blue diamond.